Choose Your Size Now and Click on the Yellow "Add to Cart" button above, or check out the offers on our other Copper Infused products by clicking on the grey "Special offers for this item" button also above. 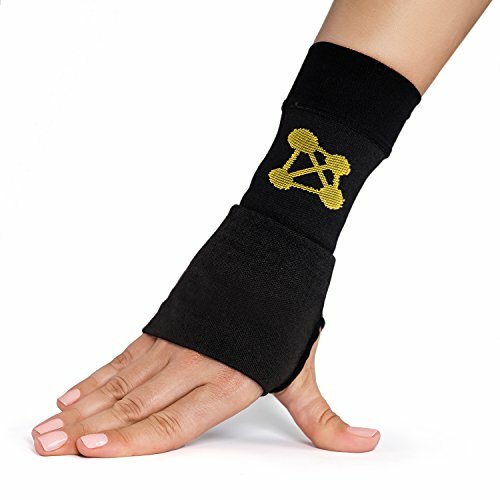 Durable, light weight and comfortable, gives you just the right level of support, keeps your sore wrist secure and warm so YOU can feel better and more secure, gives you added comfort, takes the pain away and helps you move around easily. Has a cooling effect, doesn't cause skin rush, easy to put on, fits well, feels great all day without any sweating. It doesn't roll, slide or slip. The fabric is very strong and it reshapes perfectly after each removal. It has a healing capability for your body (perfect after surgery). You will notice a remarkable difference, the pain will decrease, your wrist will feel better and it will help you playing sports with no pain.